Apple today launched new online stores for four new countries: the Czech Republic, Hungary, Poland, and the United Arab Emirates. 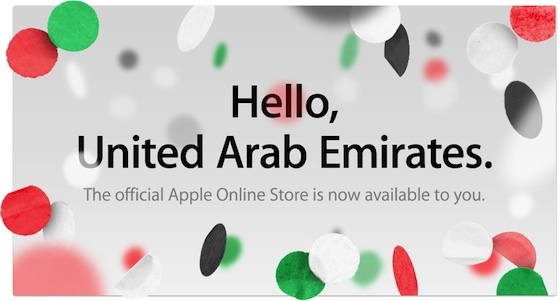 The new online stores are advertised prominently on the respective country-specific main Apple pages, which display welcome messages on top of confetti in each country's national colors. The new stores allow users to purchase directly from Apple, offering standard Apple pricing for the markets and integration with Apple sales and support services. With the four new stores, Apple now offers online stores for 37 countries, with several of those countries seeing their stores offered in multiple languages. This is the moment I, and many people in Poland, have been waiting for. No more waiting, higher prices and wanky support. Thank you Apple. It took you like 25 years but here you are. Dzięki! i like the different colors of the same confetti picture. Interesting how the colors are different but the arrangement of confetti is identical in each graphic. ...And how each country has at least red and white included in their national colors. Great, finally Czech Republic has an Apple Online Store. Now just give me the iTunes Music and Video Store, the iBookstore, Photo Book printing, GarageBand lesson purchase, etc., and it will be magnificent :) Hope Apple Online Store today is just a start. Still no Online Store for India. How long will we have to wait Apple? This is the first signal of a long-awaited Eastern European expansion from Apple. Nice to see them finally coming to their senses and admitting that they might have a market here. Good news, the iPhone pricing in Czech Republic is great. Finally the carriers will be forced to lower their pricing. Now iTunes and iBooks is left, but that isn't probably happening anytime soon, due to current patent laws :(.